The Lake St. Clair Guide provides directories for “Services in Fair Haven” St. Clair County for boat and marine. The Fair Haven area offers many options for marinas! Also many brand certified engine and marine services are here on and around the water. Besides nautical shopping for you and services for your boat, the Lake St. Clair Guide service directories include restaurants where boats can dock, waterfront things to do, and updated calendar of events & activities. Click around our website and check out the latest edition of the annual Lake St. Clair Guide magazine to keep on your boat. “ZOOM in” on our interactive Lake St. Clair maps for detailed satellite water entrances & basins to help guide you into these Lake St. Clair boat marine Fair Haven area services! Anchor Bay Marine Supply – in the big yellow building on M29 in Fair Haven – offers marine service, parts & marine boating store, indoor storage, and detailing. Explore the world below you with Anchor Bay Scuba! Daily scuba classes by our staff of certified instructors for children and adults. Full line of scuba & snorkeling equipment in stock! Regular group salt and fresh water dive adventures! Blue Water Bait & Tackle on northern Lake St. Clair’s Bouvier Bay is where the locals visit for their fishing supplies for Bass, Muskie, Perch, Pike & Walleye. Read all editions of the Lake St. Clair Guide magazine since 2001! Also read the latest “Restaurant Handbook” of over 20 waterfront area bars and eateries for Lake St. Clair. Bouvier Bridge Marina is the best kept secret on Lake St. Clair! Nestled in the tranquil waters of Bouvier Bay, our cozy marina offers showers, laundry, clubhouse, wi-fi, game room, exercise room, heated swimming pool, on site fuel dock with pump out, and more. Hungry before getting that early start fishing or boating? Buck’s Diner serves the best breakfast on Lake St. Clair… and we are open 7 days a week at 6am! You’ll find your favorites fresh and cooked to order. We are open until 2pm, so stop by and have a sandwich … or order a carry out on the way to your boat. Coastline Power & Lighting Fair Haven specializes in ELECTRIC TROLLING MOTORS and BOAT HOIST & DOCK ELECTRIC services. Full trolling motor repair and carries top brands such as Minn Kota & Cannon. Coastline also provides Boat Hoist Electrical services – Wiring / Outlets / Motor Repair & Replacement & Boat Hoist Remote Control Systems. Craftworks Classics offers in-harbor wood boat service on Lake St. Clair! Interior and Exterior Wood & Fiberglass Boat Remodeling and Restoration Fair Haven (Ira Township), Michigan. 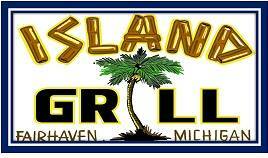 The Island Grill, located at Mayea Marina, is a 2nd floor Florida Key’s style outdoor eatery which overlooks Lake St. Clair. Boasting the best BBQ’d burger on the lake, plus a full menu, and bar. Lots of guest wells, and wave runner access next to restaurant. Located in one of the oldest bar’s in Fair Haven – and recently updated, we serve Detroit style coneys, large perfectly seasoned grilled chicken Greek salads with artisan lettuce & homemade dressings, melt in your mouth pastrami and corned beef sandwiches, huge burgers, hand breaded onion rings ….. We offer a full bar with several specialty & craft beers on tap. The Lake St. Clair Guide magazine provides a comprehensive Boating Services Directory around Lake St. Clair in Macomb & St. Clair County. Use our website to find direct links to phone & websites when you need service quick! 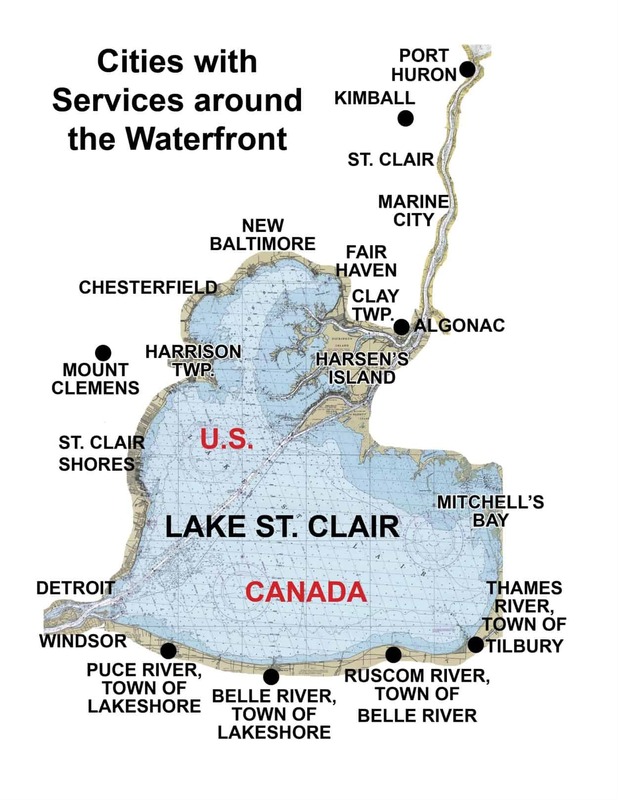 Lake St. Clair Guide magazine offers GPS map to boat & marine fuel options, food, beer & wine carry out on the water, pumpouts, and marine supplies around Lake St. Clair, the North Channel, South Channel, Detroit River, and St. Clair River …. United States and the Canadian Shorelines. Need a Map to Lake St. Clair DNR and Public Boat Launch Ramps? How do I get a Michigan Fishing License? What are the Lake St. Clair Fishing Regulations? 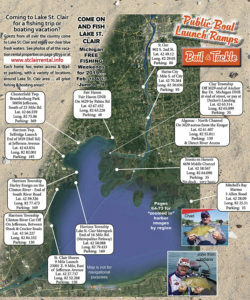 The Lake St. Clair Guide magazine and website provides several maps and publications to help you make the most of your time on Lake St. Clair. No wake zones are prevalent in the St. Clair Flats areas of the North Channel, Middle Channel, Sni Bora – Chenal Bout Rond which feed Lake St. Clair. However there are no wake zones on Lake St. Clair in front of St. Clair Shores. A no wake zone can also be found on the Detroit River along the Belle Isle U.S. side. Don’t get a needless ticket, and check out the map of Lake St. Clair No Wake Zones. Even if you do not see a marker, you are responsible to know the law. Lake St. Clair Guide has a map of Lake St. Clair Restaurants with quite the variety of fun and food with dockage around the water. Live entertainment, tiki bars, great views, bikinis & sandals…. It’s always fun to wine and dine at restaurants with the local boaters! Where to swim on Lake St. Clair? Lake St. Clair offers clear blue water, with lots of shallow areas with no weeds and hard bottoms to hang out with other boaters. Many areas shown on the map of where to swim on Lake St. Clair offer protected waters for water skiing, tubing, and kayaking. The Free Guide to Lake St. Clair offers several maps of Lake St. Clair Marinas, St. Clair River & Detroit River Marinas, and Canadian Marinas. The free online Lake St. Clair Guide magazine includes listings, addresses, and full details of many many transient marinas to help you enjoy your visit. Mayea Marina has remodeled the entire marina! Deep water for up to 50′ boats. Home of the new Island Grill clubhouse restaurant. Fuel dock with pump out, party store with beer & wine, new docks, and more! The Raft Bar is truly a Lake St. Clair local’s bar since 1976! Located on Northern Lake St. Clair on Bouvier Bay, visit us by boat or car. The Raft Bar has lots of dockage at the end of our newly dredged marked deep channel. Famous for the “Raft Burger” and perch fry dinners on Wednesday & Friday. Schneider’s Motorsports has moved to a larger location! Engine, boat, dock, and trailer sales, full service marina, parts store for Boats – ATVs – PWCs – and Snowmobiles. We also offer heated and cold indoor & outdoor storage. Stop at Shore Thing Market – BP, a short boat ride through the Swan Creek off Anchor Bay before your trip out on the lake, or your trip home, to pick up those needed extra items…. or stop by with the family to enjoy a fresh milk shake or fresh ground coffee. Stuck in Seaweed Coastal Décor & Design is located street side of Mayea Marina and The Island Grill. Open April thru December, stop by and visit us for interesting home accents, furnishings, nautical casual wear, jewelry, and gifts. Find out were to stay, what to do, where to eat on Lake St. Clair and much more with the Lake St. Clair Guide. Online copy is available to read for free and print magazine copies available February 1 each year. Besides being a boater’s & waterfront activity paradise, Bassmaster’s continues to rank Lake St. Clair as one of the U.S. best stops for fishing! Visit Lake St. Clair today, and let the Lake St. Clair Guide Magazine be your navigator. 2015 Bassmaster Pro Elites Coming to Lake St. Clair! 2015 Boating & Outdoor Festival at Lake St. Clair Metropark this Weekend!